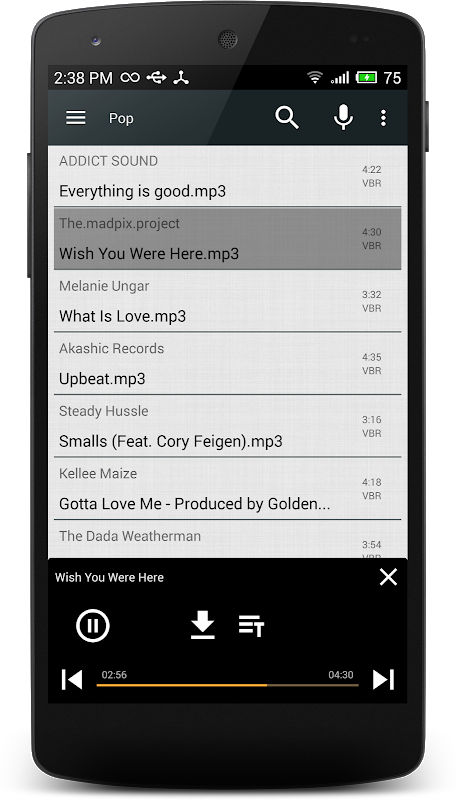 Simple and fast mp3 music downloader, powered by Outly Limited and Jamendo ( http:jamendo.com ) Application allows to stream and download any song FOR NONE COMMERCIAL USAGE ONLY! Among the main features: ★ Administrated, high quality grouping of tracks by genres, instruments, moods. 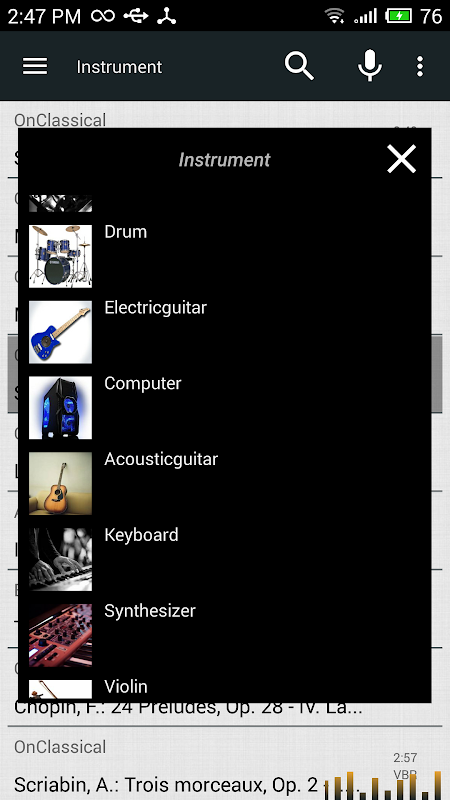 All genres, eg, Pop, Rock, Rap, RnB, Dubstep, Drum, all instruments, like guitar, piano, violin, drums, synthesizer, saxophone and many more, available in a flexible search engine! Please, take a look at screen shots. ★ Great data set, more than a million high quality mp3 tracks. One of the biggest free mp3 music storage. ★ All tracks are verified, and available for personal usage (not for commercial purposes!). 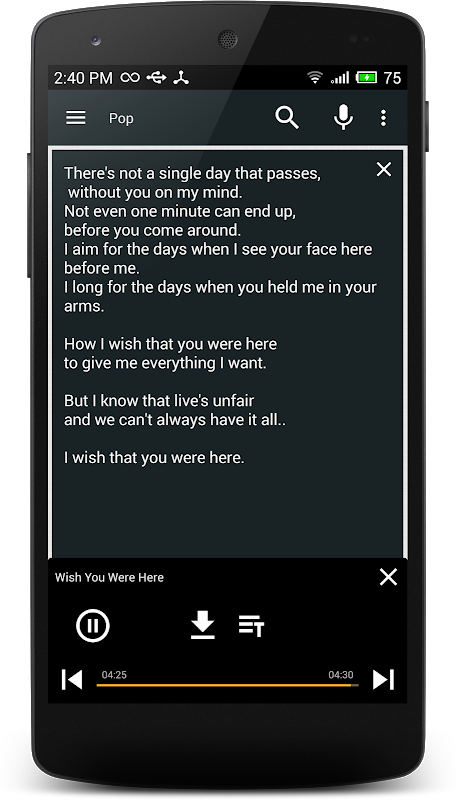 ★ Lyrics available if the song is not instrumental. 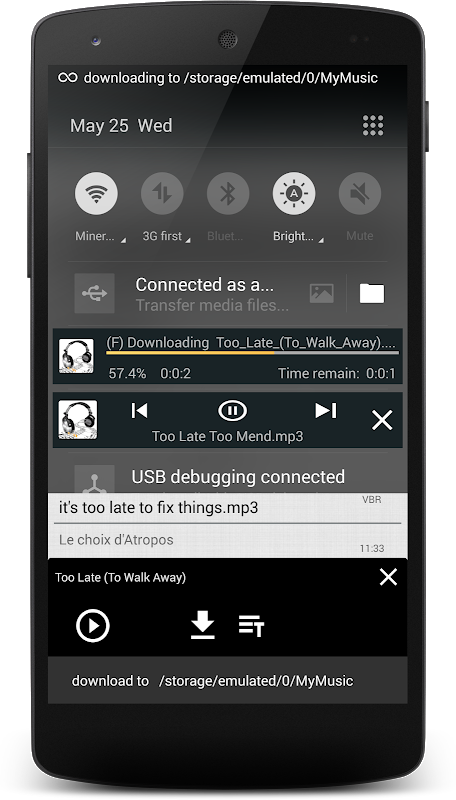 ★ Very fast and robust multithreaded mp3 download engine. ★ Flexible search possibilities (search by tracks, artists, albums, genres, instruments, moods, popularity and more). please, take a look at screen shots for details. 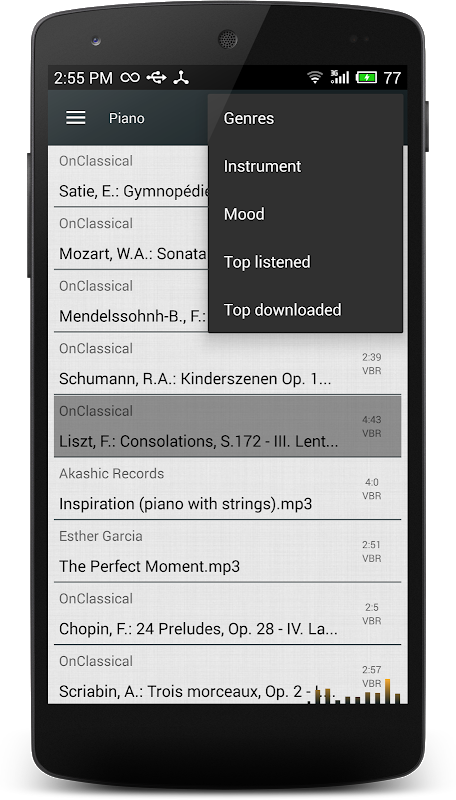 ★ You will find music for any tastes and of any kind with our app. ★ Mp3 music download never was easier! 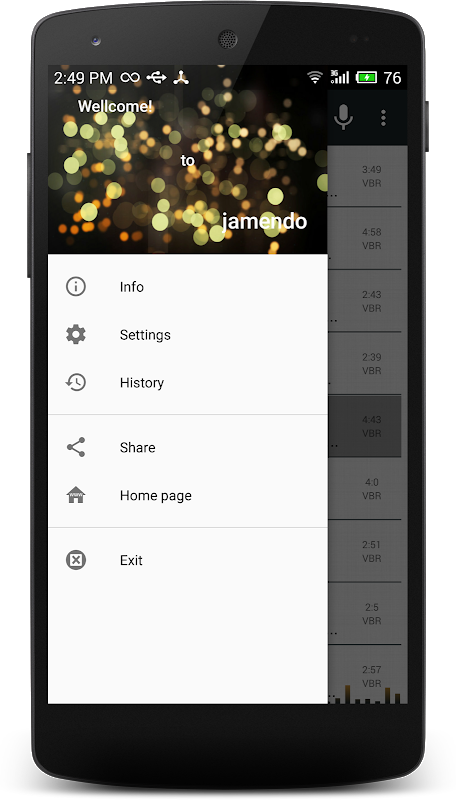 ★&emps;Embedded voice search! Our software accumulates more than a million mp3 tracks from all over the world. You will not find any well known artist here, instead of that, we offer a great collection of artists, which are not acknowledged yet. Give them a chance, try the music which is not played on the radio and tv YET. All music is HQ, all songs are completely free. You can freely listen and download them (not for commercial usage, if You need to use any track for comercial purposes, please visit http:jamendo.com website, which is the data provider for our app, and purchase a licence for commercial usage). So, download music now and enjoy P.S. 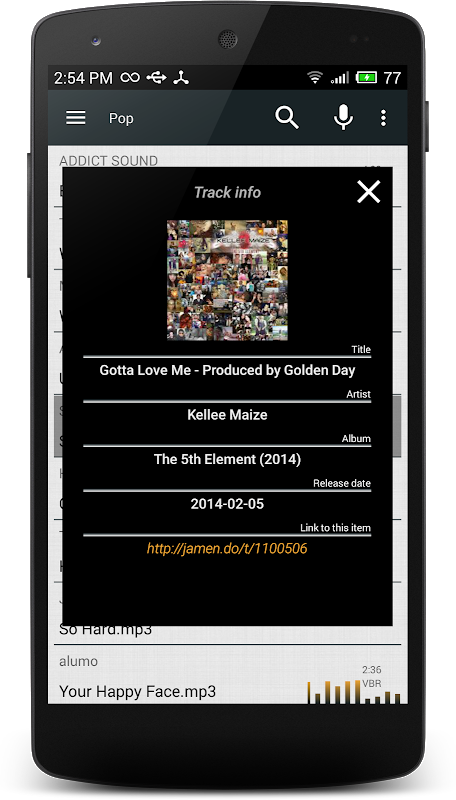 This Application is the best You can get to listen independent artists. It maximizes creativity, and inspires musicians and music lovers. Dear administrators, with all respect, please, take a look at my account, there is my email and phone number. Before make a decision, please call me, or write. I can provide all the documents, from my national passport and vat to signed agreement which gives me the right to distribute music. You can also contact JAMENDO SA if you do not belive me. They will confirm the validity of the agreement. I hope for constructive cooperation, thank you!  Website: Mp3 Music Downloader | Outly LTD.
 Is Mp3 Music Downloader yours? Claim it!